Wilson 803570 AG Pro Quint Coming Soon! Wilson’s brand new 803570 AG Pro Quint is coming soon! 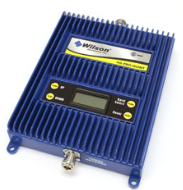 The AG Pro Quint is a new cellular booster/amplifier product from Wilson which covers an incredible 5 different signal bands. It’ll boost signals on 800 MHz, 1900 MHz, AWS and both AT&T and Verizon 4G LTE networks. The only network that isn’t supported is Nextel, which is currently being phased out. The AG Pro Quint has a massive gain of 75 dB and 630mw output power, allowing it to cover up to 80,000 sq ft with a good signal outside of the building. Offices, warehouses, hospitals, fire stations, and government buildings are all well suited. The AG Pro Quint has a compact design, smaller than a textbook with a weight of less than 3 lbs. It’s the first Wilson amplifier with an LCD display and push button controls. This aids installation, allowing the gain to be finely tuned on each of the 5 frequency bands.